What is Jagua And How Does It Work? How Long Will My Jagua Tattoo Last? How Do I Take Care of My Jagua Tattoo? How Long Will It Take For My Temporary Tattoo To Dry? Does Jagua Come In Other Colors? I Got A Jagua Temporary Tattoo, But It Doesn't Show Up. Why? Will Jagua Show Up Well On Dark Skin? How Is a Jagua Tattoo Made? Jagua is the trade name for the skin dying gel made from the rainforest fruit Genipa Americana. For thousands of years, the South American natives have used the blue black dye obtained from the squeezing of the unripe Genipa fruit to adorn their skin and ward off stinging insects. This blue/black non-permanent dye creates a temporary tattoo when applied to the body and wears off only as the epidermal layer of skin to which it is applied wears off. For more in-depth information about the Genipa Americana, see the following link. Why Jagua? Is It Really Better Than Henna? Jagua creates a blue/black, realistic yet temporary tattoo. Currently, it is the only safe method of producing this kind of image. Henna in itself is not dangerous and produces a red/brown temporary tattoo. Black henna on the other hand has additives to alter its color and produce a realistic temporary tattoo. It may sound good in theory, but the chemicals added are harsh and can cause blisters and permanent scarring. Your skin type, lifestyle, and the location you choose to place your tattoo will all affect the duration of your temporary tattoo. In most cases, a Jagua tattoo will last for 2 weeks up to one month. Frequent swimming, trips to the sauna and exfoliating all shorten the life of your Jagua tattoo. Tattoos on the hands, face, and neck wears off the quickest and those on the arms tend to last the longest. No matter what skin type, lifestyle, or location of your temporary tattoo taking care of it will extend its lifetime. Apply petroleum jelly or light massage oil to your tattoo before bathing, swimming, or sleeping. Avoid any abrasion of any kind in the tattoo area. Apply anti-perspirent to your tattoo before activities that may cause you to perspire and use sunblock when tanning. Keep your body well hydrated and your skin moisturized. *Jagua is very new to the western world and we all still learning Jagua! Although Jagua is a natural food product and has been used for thousands of years on kids, woman and man as part of their daily routine and not only for nutritional purposes and skin dye, but for herbal healing as well. It is possible to have an allergic reaction to any foreign substance applied to the skin. We encourage People with sensitive skin, before applying a full sized Jagua Temporary Tattoo to test a small patch by applying a small dot of Jagua behind the ear to test your sensitivity to Jagua. We have sold thousands of Jagua temporary tattoo products and provide it as a service at our shop and have only a few cases of allergic reactions each year. An allergic reaction to Jagua will appear as a dense rash of hard red bumps and may look similar to the allergic reations caused by PPD or Black Henna. Unlike PPD or Black Henna, an allergic reaction to Jagua will not create a lasting scar. This rash can be treated like any other allergic rash with the application of anti-itch cream and/or Cortizone. Before treating any allergic reaction, it is essential to consult your health care professional! We speculate that there is a connection between high alcohol/drugs levels and how the body reacts to Jagua. It is not wise to expose heat in any form to a fresh applied Jagua tattoo in the first 48 hour of the tattoo development or painful scarring will occur. *Warning -The safety of this product has not been determined. Your Jagua will be dry to the touch in one hour, but should sit on the skin for at least two full hours before you peel the gel. The longer the Jagua has contact with the skin, the darker your temporary tattoo will be. Always make sure to remove the gel and wash the area before sleeping. Sorry, no. 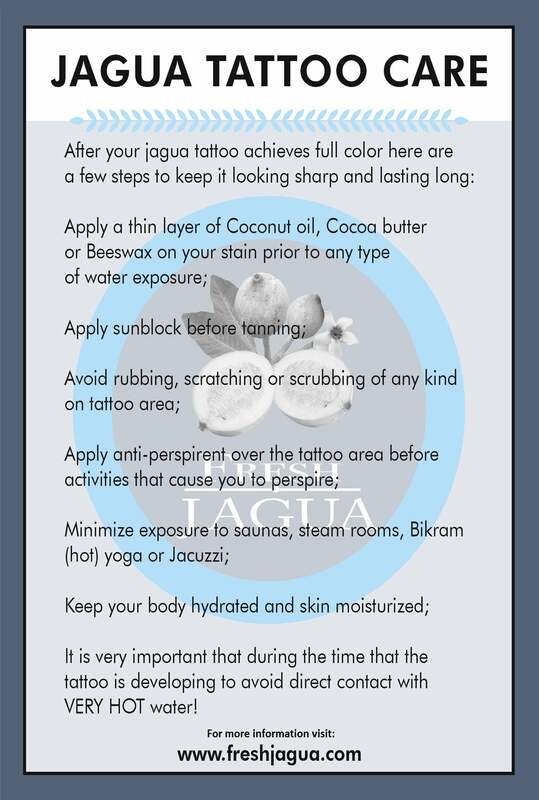 Jagua is a natural product and is always blue/black. The exact shade is determined by the individual’s skin tone. Relax, its not suppose to show up right away. When you peel off the gel, your Jagua temporary tattoo will be light grey and look like a shadow on your skin. Give it a few hours and you’ll notice it starting to darken. In 12 hours you will have a blue/black tattoo that depending on your skin type may continue to darken for another 24 hours. Absolutely! The original Jagua artists are a dark skinned people! On light skin, Jagua shows up more in the bluish end of the color range and on dark skin it is more blackish. It appears with in the blue/black tattoo color range on all skin tones. Remember, the fresher the Jagua, the darker the stain. Jagua temporary tattoos are made using a blunt ended needle to draw a design on top of the skin. Even though the applicator is called a needle, this process does not hurt. It is just like icing a cake. The Jagua is squeezed onto the skin and then left to dry for two hours. During the drying time, one must be very cautious not to smear the Jagua on to clothing or other parts of the body to avoid staining and/or distortion of the tattoo. Once the temporary tattoo has dried, the Jagua is then peeled off and the area washed with warm soapy water to remove all traces of stain. At this point, it will be tempting to freak out. It doesn’t look the Jagua you purchased is any good, but just relax. The light grey “shadow” on your skin will start to darken as it reacts with your skins pigment and will continue to darken for 12-48 hours. The shipping cost is calculated online according to the weight of your order and your location. Put your desired products in the cart and go to check out. Before you proceed to payment you;ll see the exaxt shipping cost.